This track was built as a result of the mining industry in the South Banat. 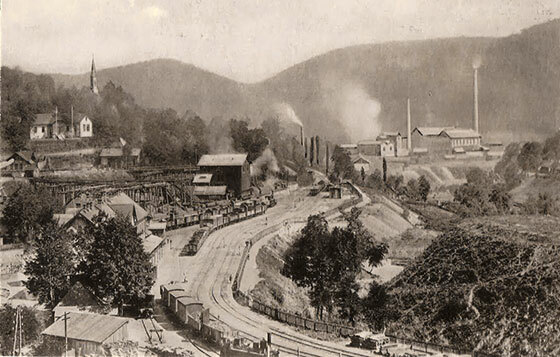 The coal mining led to the need of transporting the coal to the Danube, where it was loaded into ships, and from there, sent into the Austrian Empire. In 1847, Oravita–Steierdorf–Anina road was completed, road needed for the coal transport from Oravita by horse-drawn carts, means which progressively stopped satisfying the transport needs and led to the emergence of the need to build a railway. 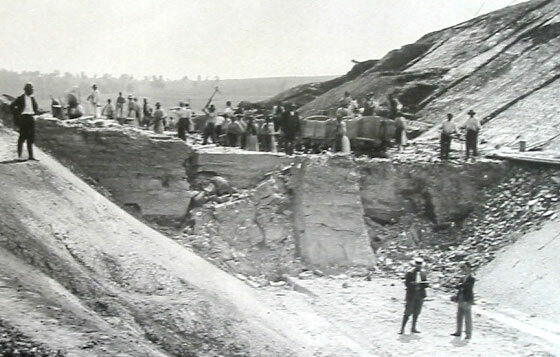 Regarding the construction of the Oravita-Anina track, several projects existed, but only in 1855 the construction of the Oravita-Anina track took shape, when the railway in Oravita was taken over by StEG (acronym for Staats Eisenbahn Gesellschaft, complet Kaiserliche und königliche privilegierte österreichische Staats Eisenbahn Gesellschaft, translated as "Imperial Royal Privileged Austrian State Railway Company), an Austrian-French Company, established in 1834 in Vienna, which had built the first railways in Banat and present-day Romania and, until the First World War, had the ownership over most of the Highland Banat. For the route Oraviţa-Anina, the 1847 project by engineer Anton Rappos provided for a normal track with steam traction engine to Lişava, up to there the coal would have been brought from Anina through a very long underground gallery named „King Stephen” by using horse powered traction. After 1852, as the performance of steam traction engine increased, Rappos project was drastically changed, giving up the idea of underground galleries. The works were carried on until 1854 upon the completion of funiculars on the steeper section Lişava-Anina. The section Oraviţa-Lişava was built by engineer Bach, and the continuation of the works was handed over to inspector and engineer Dülling. Between 1860 – 1863, the construction of the new normal railway track with steam traction engine on Oraviţa–Anina,section was completed, its maximum elevation point being in the tunnel Gârlişte, the longest from the route. The Privileged Austrian State Railway Company had operated the railway from 1863 until 1891 when it was nationalized and given for operation to MAV, according to the original conditions set in the concession agreement. In 1918 according to the provisions of Treaty of Trianon, the Oraviţa – Anina railway ownership was transferred to the Romanian State, and it has been operated by Administraţia CFR. 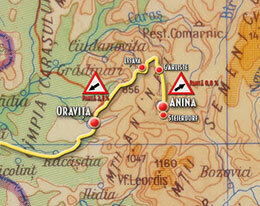 At the time, the track Oravita-Anina experienced an extraordinary concentration of strengths and was built with local labour force, being employed the local people. A significant part of the population was made of settled inhabitants of Oltenia, such as bufenii and tyroleans settled in Oravita after 1717 and who were at the foundation of Highland Oravita. Masons from North Italy, were brought too, also known as friulani (Friuli) whose descendants still live today in this region. Those people, renowned craftsmen for stone sculpture, left behind not only the Oraviţa-Anina railway but also a series of stone and marble sculptures. They spread all over Banat and their descendants still live among us, but their great grandchildren may no longer know what their great grandfathers were very good at. They are still found in Oraviţa, but also in Reşiţa and Bocşa under the name of Ansolutti and Buzii, (descendants in Resita), Gusetti and Gazzolli (descendants in Resita and Bocsa), Gittera, (Oravita), Gotthardi (Oravita), Mationi (Oraviţa), Masuti (Oraviţa), Mihali (Oraviţa), Pecci (Oraviţa, Resita), Parteli (Oraviţa, Reşiţa). The initiation took place on 15 november 1863 with a C-2-t Engerth locomotive, that pulling six wagons Oraviţa station. Together with the engineman Wenzel Hantscke, in the locomotive there were inspector Dullnig, engineer Bach and architect engineer Maniel. After the locomotive and tender, there was an open platform where seats were arranged for minister Thinnfeld, secretaries Layer and Hocheder, von Gränzenstein and von Berg, director of Directorate Mountains of Banat, Friedrich Reitz. There were also present Hungarian Count von Bissingen of Iam, Count Hermann Gerubel, Baron Anton Baici of Varadia, Hungarian Count Julius Despinici of Comoraste, Hungarian Count Vladimir Stojanovits of Latunas-Marcovat, Baron Wodianer, the minister to be, native from Oraviţa, Jozsef de Szlavy, architect Ioan (Johann) Bibel, metallurgical engineers Karl Maderspach and G. Werne, pharmacist Karl Knoblauch, doctor Fr. Bach, brother of the railway engineer. Seals leave the station at 9 o'clock from Oraviţa station and after two brief stops at Gârliște station (then Carașova) and at the Jitin viaduct, reach Anina at 12:30 a.m. It took more than five years to prepare the line also for the people traffic so that only in 18/28 november 1869 is put into use the first trainset for passengers and mail. 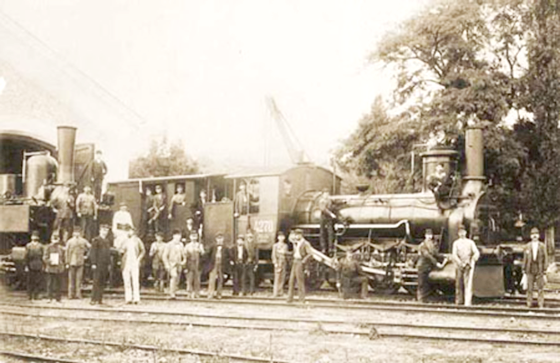 On 20-21 september 2013 in Oraviţa and Anina were celebrated 150 years since the putting into service of the first mountain railway on the current territory of Romania. On this occasion an A4, poster was made, which may be downloaded here.